A bad witch's blog: Tales from the Witch Room: Wow - What a Mess! Tales from the Witch Room: Wow - What a Mess! 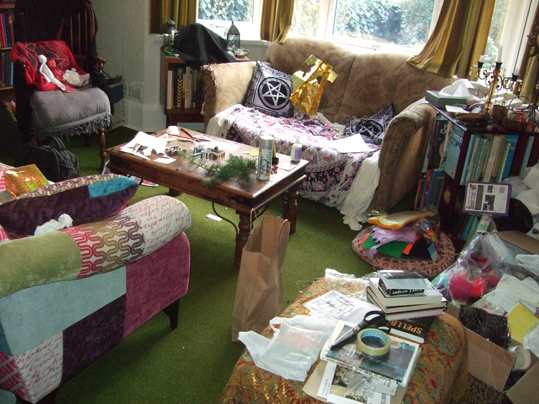 This is what my witchy room looked like yesterday morning - what a mess! There were craft supplies all over the place, some lavender drying in a brown paper bag on the floor and a heap of books and tarot cards not put away. I've been so busy running workshops and also doing my university coursework over the past couple of weeks that I hadn't had time to do housework. I'm pleased to say it is a bit tidier now as I spent the morning reorganising my box of crafting things, bottling the dried lavender, placing things back on shelves and taking a pile of paper out to the recycling. I had been intending to spend the day finishing all the preparations for the workshop I'm running in a week's time to make Yule tree fairies and angels. (You can find out the details for that on my events page.) I did get quite a bit done in the afternoon, but I really couldn't work in all that clutter. Mind you, I later discovered I had completely forgotten I was supposed to be meeting a friend for coffee! She was very understanding, considering how rubbish I was. After I apologised over messenger, she offered some great suggestions for improving my workshop. Housework is just so boring.